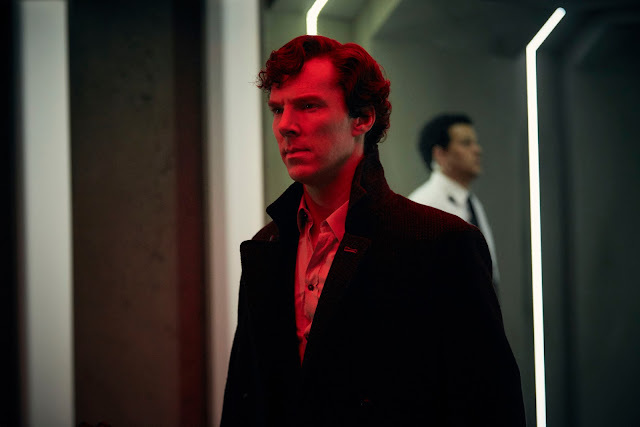 The Custard TV: Sherlock: What did we make of Episode 3? Sherlock: What did we make of Episode 3? It’s shock blankets a-plenty in the Sherlock fandom tonight as ‘The Final Problem’ made its explosive debut on television. Yes, tonight’s episode finally answered a lot of questions and posed a couple more, but we’ll get to that at the end. Opening with a horror sequence akin to a blending of Doctor Who and The Shining, ‘The Final Problem’ attempted to recreate the type of episode we saw in ‘The Hounds of Baskerville’ with a couple of horror trope boats full of creepy little girls, clowns and dodgy electricity being pushed out. Whilst it was definitely a creepy opening, it maybe didn’t have the impact it was going for. Of course though, this all changed with the arrival of this week’s mystery: Eurus. Sian Brooke’s Holmes sister was chilling, creepy and dangerous; in fact scarier than all the daft clowns and horror clichés seen at the beginning of the episode. The true horror of not only Eurus but Sherlock and Mycroft’s upbringing was revealed as Redbeard wasn’t in fact a beloved dog, but was a friend. When John picked up the child’s skull, I would be surprised if anyone actually really saw that twist coming. At this point, a note must be made of Mark Gatiss’s fantastic turn in ‘The Final Problem’. Truly a tormented brother, it came to light that Mycroft was not only keeping governmental secrets, but also manipulated every member of the Holmes family in order to keep Eurus hidden. His personal torment throughout could have been an episode on its own, and it was good to see development of those outside the ‘good guys’ clan. Whilst this episode contained plenty of twists and turns along with the return of everyone’s favourite bad guy, Jim Moriarty (I’m glad they didn’t pull a Jon Snow and actually kept him dead), this episode probably won’t be liked. There’s no two ways about it, this episode carried high expectations, and was the ending a little rushed? Yes. Was it believable that Eurus could be contained for long enough to be recaptured with just a hug? No. But nevertheless, this was a fearless episode of Sherlock. An episode that wasn’t afraid to put all characters to the brink, with one particularly memorable moment being John’s torment as he was about to kill the head of Sherringford. I don’t know about anyone else, but I thought he was going to do it. Heck, at one point, this was an episode that not only killed one child in Victor, but was about to kill another on the plane; yes, she technically didn’t exist, but it’s always distressing to see scenes like that. So where does that leave us for series five? It all looks pretty peachy for Sherlock, John et al., with the gang returning to their own kind of normal. Nothing quite screams ‘this show will not return’ like a happily ever after montage and a freeze frame style ending. If it’s not finished, then it’s definitely geared for a hiatus, and maybe it’s needed. 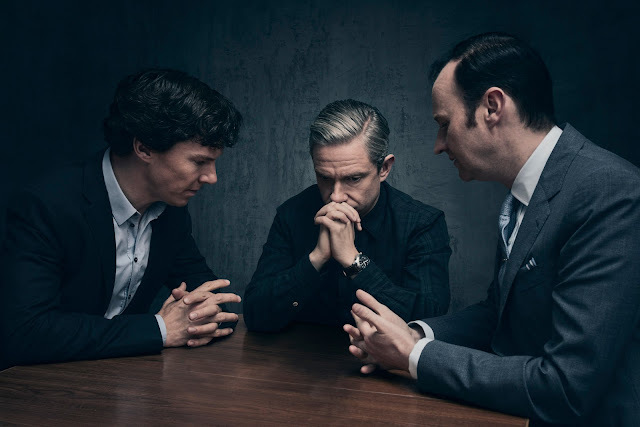 This season has been generally fantastic, and I would personally rather wait for three more well-thought out episodes than rushed attempts at resurrecting the demons of yore; maybe it’s time to refocus on the mysteries now we seemingly know all we need to about the Holmes family. In all, it was a game well-played by Gatiss and Moffat, and 2017 has certainly started well. But for now, it’s time to put away the Cluedo board again. It looks like it might not be coming back out for round five any time soon; we’ll be waiting for it when it does. I enjoyed the episode enormously, and it improved even further on a second viewing. It managed to be tense, funny and moving - the latter particularly in the phone conversation between Sherlock and Molly and when Mycroft was trying to goad Sherlock into shooting him rather than his best friend. And I agree with you about Mark Gatiss; I thought he stole the show, and when you're sharing a screen with Benedict Cumberbatch at the top of his game, that takes some doing. It did look like the final episode to me, and if it was, I think that's fine. It contains some of the best writing and acting I've ever seen on British television. Bravo to the writers, cast and crew - and thank you!